Photo by Lynne Stone Area resident Lynne Stone recently photographed this yearling wolf, a member of the Stanley-area Basin Butte wolf pack. Along with other wolves in the state, the Basin Butte pack may face hunting pressure as soon as fall 2008 if delisting from the federal Endangered Species Act proceeds as planned. For wolf B312 and the rest of the Basin Butte wolf pack, home is a sweeping stretch of central Idaho backcountry. Covering some 250 square miles where the Sawtooth, White Cloud and Salmon River mountains meet the lower Stanley Basin, the area is a mosaic of aspen and conifer forests, sagebrush-covered hillsides and wide open grassy flats. No surprise, then, that it's also a landscape rich with elk, mule deer and other prey, one that any wolf would love. Biologists with the Idaho Department of Fish and Game first confirmed the presence of the seven-member Basin Butte pack after they were linked to a livestock depredation incident in the spring of 2006, Fish and Game Large Carnivore Manager Steve Nadeau said Monday. The pack is named for nearby 8,854-foot Basin Butte, which lies north of Stanley in the southern Salmon River Mountains. Like most wolves in Idaho, B312 and the other Basin Butte wolves occupy a landscape where wolf-free acreage has become increasingly rare. Neighboring them are the Galena, Buffalo Ridge, Yankee Fork, Landmark, Bear Valley and Warm Springs wolf packs. "It's totally surrounded in there," Nadeau said. 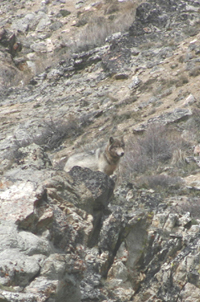 Statewide, Idaho has an estimated 72 wolf packs, he added. B312, a gray-phase female pup born last spring, was radio collared by Fish and Game personnel last year, Nadeau said. Standing along a roadside pullout near Stanley last Saturday afternoon, Nadeau focused on the pulse-like pings coming from his handheld radio telemetry receiver before a crowd of about 25 Idaho Conservation League (ICL) members. They were on a wolf field trip with Nadeau and several other wolf experts as part of the ICL's three-day Wild Idaho Conference, an annual rendezvous the group hosts at the Redfish Lake Lodge, near Stanley. Miles away to the north was the source of the pinging. Somewhere in those roadless mountains was the youthful B312. Used from the air on a clear day, receivers like the one Nadeau used can detect a radio-collared wolf from as far away as 20 miles. On the ground, topographical obstructions such as mountains or ridgelines can dramatically reduce that distance. After leaving the roadside pullout, Nadeau and the ICL members caravaned to a nearby grassy basin ringed by partially timbered slopes. Leaving the road, they climbed single-file to the top of a hill looking for B312 and others from the Basin Butte pack. Along with Nadeau, other wolf experts who took part in the outing included Curt Mack, gray wolf project leader for Idaho's Nez Perce Tribe, Suzanne Stone, Northern Rockies representative for Defenders of Wildlife, and Lynne Stone, director of the Boulder-White Clouds Council. In the end, no wolves showed. However, the group did listen to the four speakers talk about wolf habits, their recovery and the prospects for a wolf hunt should the U.S. Fish and Wildlife Service delist wolves in the northern Rockies from the federal Endangered Species Act (ESA) as planned by early 2008. To what extent the Basin Butte pack and other Idaho wolves end up being hunted should delisting take place may well be determined in the months ahead as Fish and Game develops a statewide wolf harvest management plan. Both at the ICL conference and the Idaho Fish and Game Commission's quarterly meeting held last week in Sun Valley, Nadeau was repeatedly peppered with questions regarding wolf hunting. To advise them on developing the plan, the agency has formed a seven-member public working group with representatives from conservation organizations and livestock and hunting interests. The group met for the first time in April and will meet again in June and July. Later this summer, Fish and Game plans to release for public comment a draft harvest plan during a series of open houses throughout the state. Nadeau said the agency hopes to have a completed plan for the commission to consider in November. While details of the plan haven't been finalized, Nadeau said wolf hunting would likely be managed either by individual big-game units or by management zones, which would include several big-game units. Depending on Fish and Game's management objectives, the seasons could be further managed under a variety of controlled and general season hunts, he said. The length of the season may also vary, and could extend from fall through April, which is considered the "prime pelt period" for wolves, Nadeau said. Much like mountain lion hunts in the state, hunting quotas will likely be set by individual wolf management areas, he said. Details of the plan will likely remain in flux until it reaches the commission, Nadeau said. "Nothing is set in stone. Everything is in draft form," he said. During the ICL conference, it became abundantly clear that not everyone believes Idaho wolves should be hunted now or anytime soon. Suzanne Stone is among those virulently opposed to the prospect. Perhaps more than anything else, Stone believes the social perception of wolves needs to be addressed before any management changes take place. Idaho wolves are not ruthless killers of livestock and ungulates like some believe, she said. Beyond the positive ecological role they play, wolves are also benefiting many rural communities by increasing tourist dollars. For these reasons, Stone believes strong protections for Idaho's wolves should continue. In the end, an overzealous approach to hunting may lead to dire consequences for wolves like B312 and the rest of the Basin Butte pack, she predicted. "We can have a major impact on wolves," Stone said. "We have to be cautious of that."